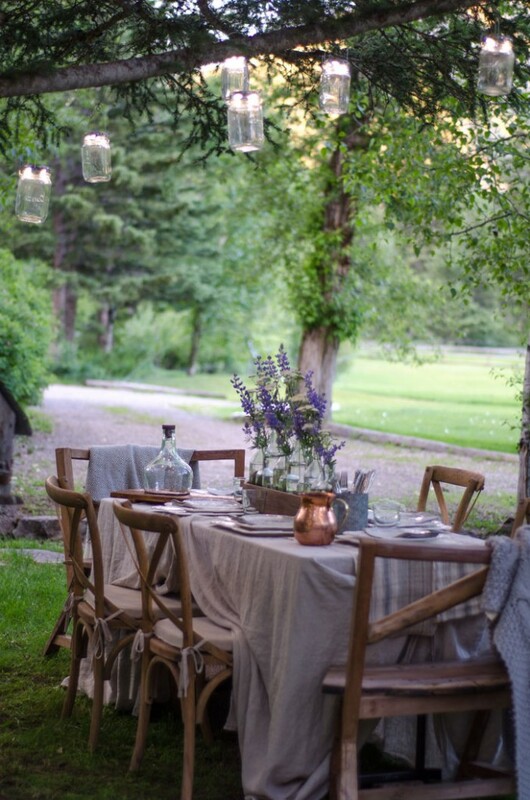 Solar LED lighting, soft linens and local flowers set the scene for a sweet gathering in the outdoors. 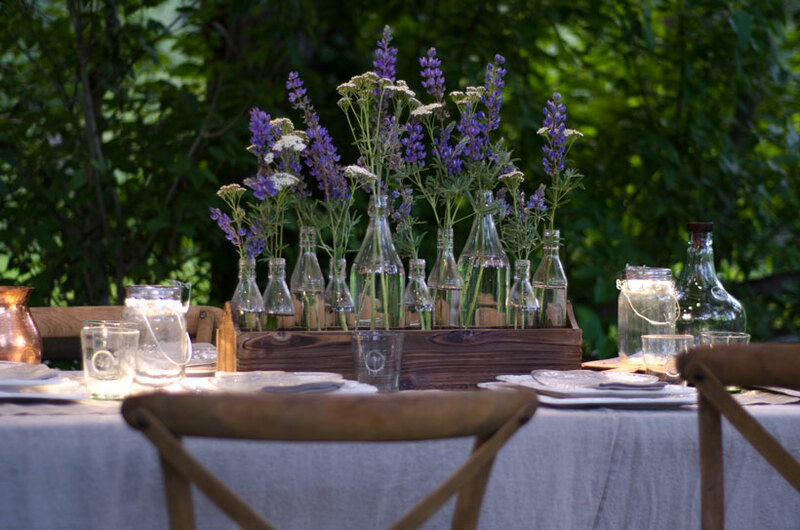 What could be more magical and romantic than a beautifully set table in an unexpected location? I was dreaming of a unique outdoor evening with friends, so I chose an opening in a grove of trees to set my late summer outdoor table. 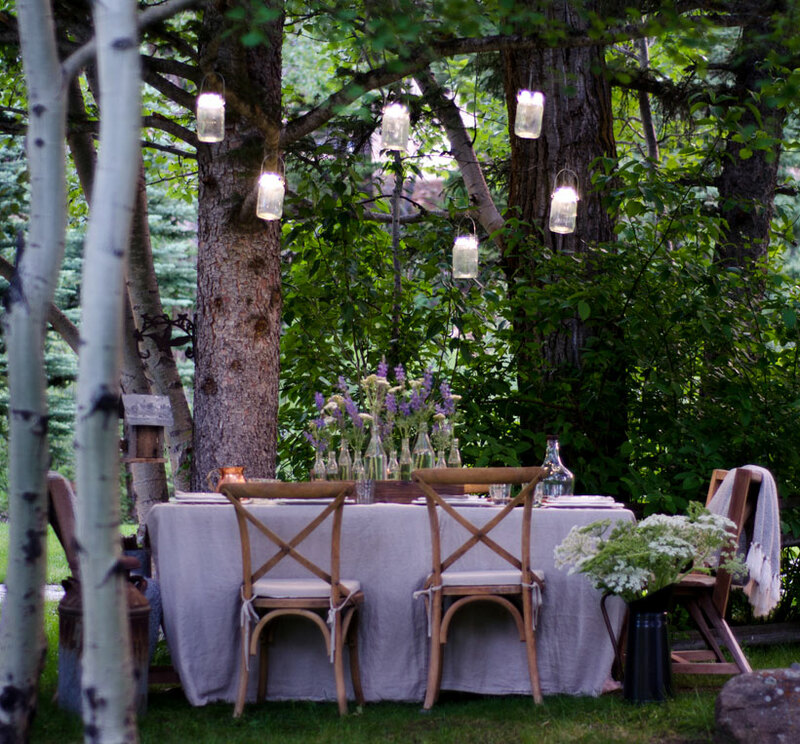 Hanging solar LED mason jar lights in the trees add ambiance to the charming table setting. Clear bottles in a variety of sizes line the interior of a narrow wooden crate. The bottles hold a chorus of lupin and yarrow, utilizing the natural flowers from the surrounding area. Since I was using a portable table (with not so pretty legs) I draped two soft linen cloths sideways, so that they reached the floor, then I pinned the cloth together on the short ends of the table to completely cover the table base. I also draped a French linen table runner with soft gray stripes down the length of the table. I didn’t get too fussy about the details, in fact I purposely left it casual and relaxed, so our guests felt comfortable. The solar-powered jar lights hung high in the tree branches seem to float over the dinner table. Complete with the soft fabrics and pale color palette, the woodland setting provides a magical quality to the evening’s ambiance. I love the look of an eclectic mix of dishes, glassware and serving pieces and don’t believe that there are any rules when it comes to place settings. 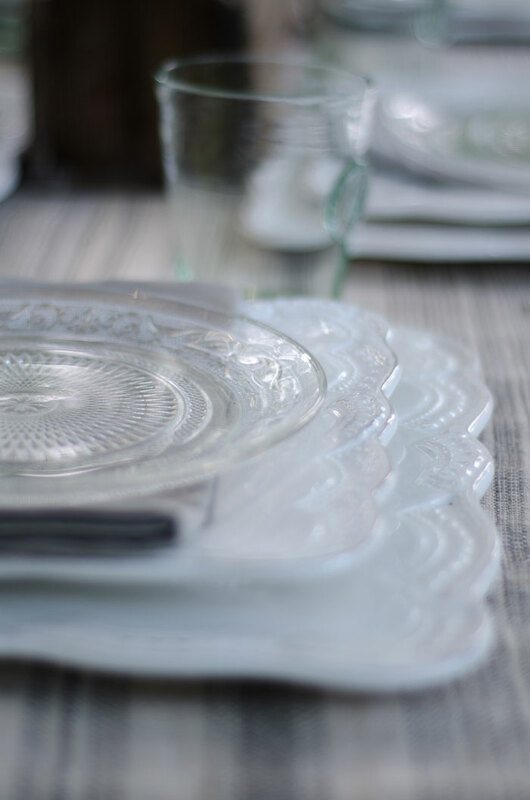 A mix of white, square and round glass plates with simple gray napkins works perfectly in this location. And while I adore a beautiful wine glass, water glasses are more practical and somehow lend a relaxed feel to the whole table. 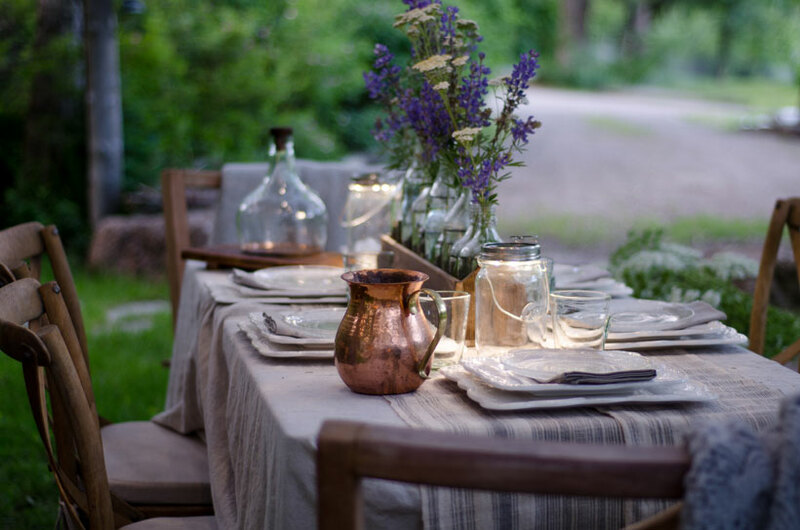 A tin container filled with silverware placed on the table works just fine and is easy to transport after dinner and the unexpected addition of a copper water pitcher somehow feels right. Clear glassware in the centerpiece and place settings add to the romantic feel, while the eclectic mix of sizes and shapes adds texture and interest. What could be more natural than using what is growing nearby for a centerpiece. 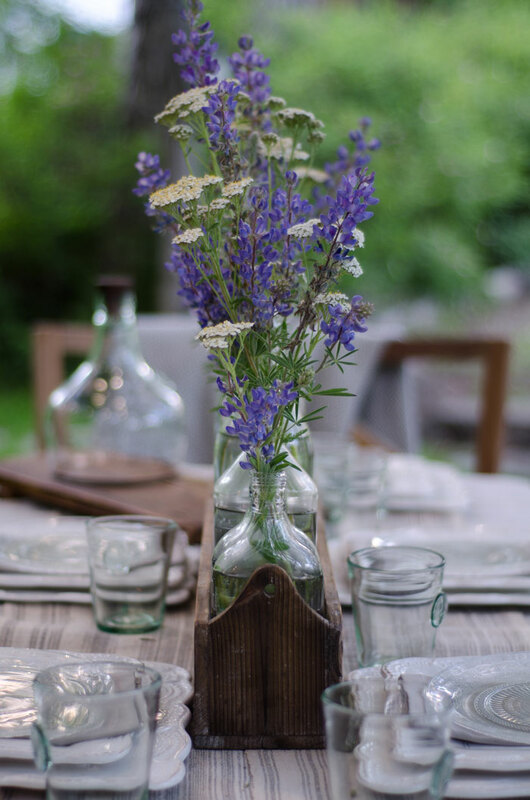 Rather than a vase of store bought flowers, I brought my favorite box of bottles out and picked some lupine and yarrow from the nearby meadow to create a pretty centerpiece. I also found a small grove of cow parsnip in the woods, so I picked several stems and put them in a large pitcher, which I placed on the ground near the table. It added a lovely, soft element to the tablesacpe and fit in perfectly with the environment. This large enamel pitcher is full of cow parsnip, a cousin to Queen Anne’s Lace. While the plant is elegant, use caution and gloves when interacting with it, as some people can experience adverse reactions when it comes in contact with skin. 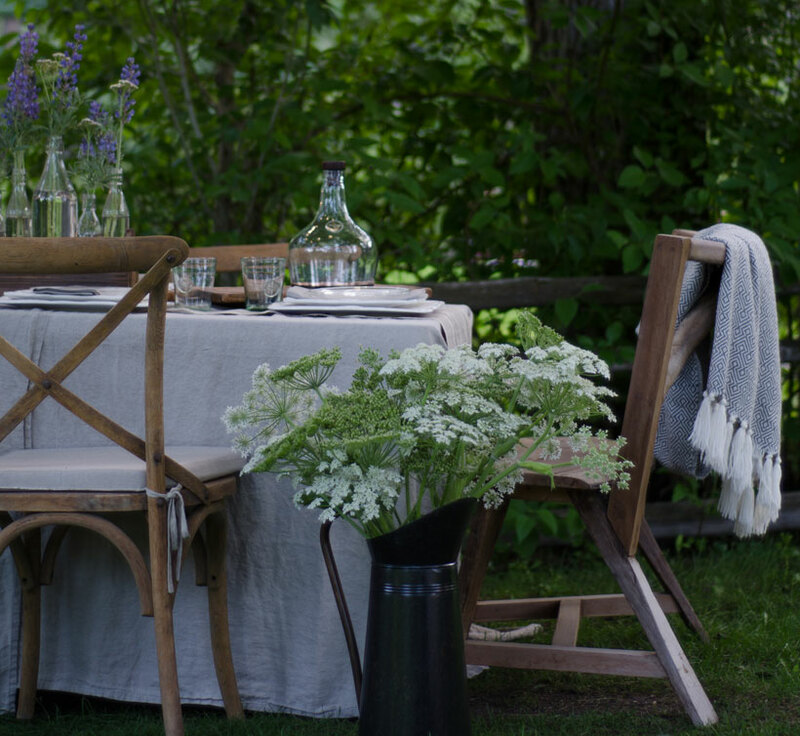 I rarely set an outdoor table without including several throw blankets hanging over the chairs. Nothing will break up a nice evening faster than cold dinner guests, so a having a few blankets available to warm legs or wrap around shoulders is a must. I also keep a can of natural bug spray nearby, just in case some uninvited “guests” decide to crash the party. The details come together perfectly to accentuate an enjoyable evening spent with guests under summer skies. A whole new world of outdoor possibilities opened up for me by using a few solar lights. These would be great for a romantic picnic in the park, an evening at the beach or any other place that you can imagine the soft glow of light illuminating a beautiful location. Karen Snyder writes about home, family and entertaining at Sanctuary Home, where her elegant country style inspires and educates.